If you’re a Christian artist who is frustrated because you struggle to make money with your art, the Your Creative Adventure podcast will help. Each Tuesday you will receive a spiritual episode with encouragement specifically for artists. Each Thursday you’ll get a business episode with practical tips to make money as an artist. Subscribe to our podcast below and automatically get notified of new episodes. Listen and be inspired! We believe it is possible to sell your art without selling your soul. Ephesians 2:10 says, “For we are God’s masterpiece. He has created us anew in Christ Jesus, so we can do the good things He planned for us long ago.” A masterpiece is the best work of an artist. Not only are you and I God’s best work, but He also planned for us to create “good things” that reflect His glory. Do you have a desire to be paid for the good things you create as an artist? 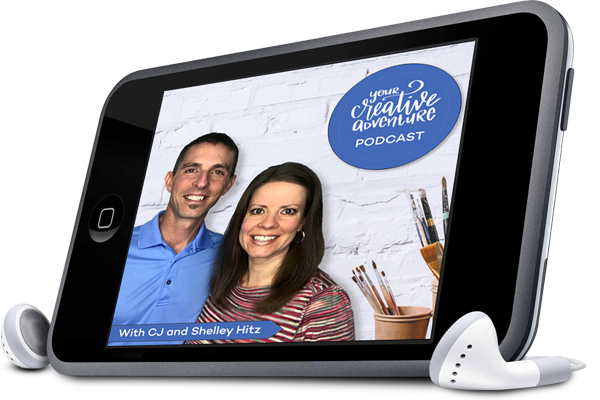 If so, join CJ and Shelley Hitz as they help you make money as an artist doing what you love while glorifying God through your art. Post a Review and Get a Free Gift! Note: If you’re unsure how to post a review on iTunes, check out the tutorial I put together for my other podcast, Author Audience here. It means the world to us when you take a few moments to post a rating and review on iTunes. As a thank you, we’ll send you our Plan It Day goal-setting worksheets, a $47 value, for free. Woot! Before you submit your review, take a screenshot and send it via email to [email protected] and we’ll send you the worksheets. Now that you’re subscribed to the podcast, here’s the next step for you. If you want to turn your passion for art into income, I have a free training for you called, “How You Can Earn a Full-Time Income as an Artist,” a $97 value. Sign up for free here. You’ll learn ten real-life examples of what’s working today to earn money as an artist. You’ll also learn how diversifying your income can help you grow your art business much faster. You may struggle if you’re relying on one income stream alone. You’ll learn how to sell your artwork online, the specific partnerships you should consider as an artist and the passive income streams that can be very profitable. Download our FREE art devotional guide, “The Art of Prayer.” We created this prayer guide for Christian artists to encourage you to incorporate art into your prayer life. This is a very powerful and effective way to meditate on God’s words while doing what you love. Download it now here!